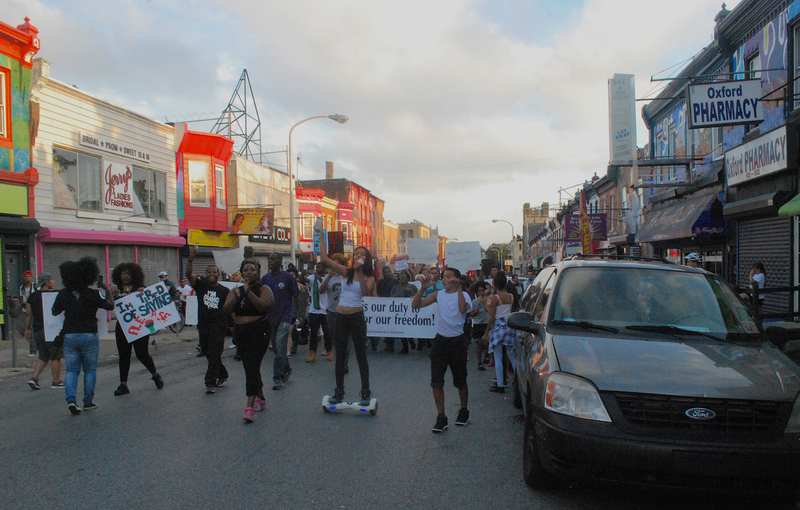 Image caption: The march Cram mentioned at the Police Advisory Commission moves north through Kensington. Photo by author. So goes the refrain of the political event chaperone cop, suspended on display to answer dumb questions and goad slow marchers to keep pace. “Yeah protesting, the new fad. It’s like the new jeans brand or something. Go back to Doylestown. Go back to your parents’ basement.” You’ll hear such side banter at almost any demonstration large enough to warrant a police babysitting detail. But Philly cops didn’t just recently invent the idea that anyone who cares about politics other than the government is dumb, obnoxious, rich, or has an insincere, dishonest and/or financial interest. This negative stereotype has been around for a while. In a 1910 Washington Post op-ed , an anonymous critic argued that people who thought women should be allowed to vote were “professional protesters” who just wanted to get attention at posh public events. Wait, who’s a threat to the public? A 2004 public notice by the FBI cited water guns filled with urine as a threat at public demonstrations. However, this was totally made up. Sociologist Lesley Wood searched police and court documents for evidence of such a practice and found none. Regardless, the image also re-appeared in judges’ rulings and police intelligence briefs. The floppy slices of wet sandwich police language hide a legitimacy struggle. If organizers can be painted as trust-funded poop throwers, the wet sandwich police wish to depict themselves as a group with no choice but to enforce order as the public interest’s realest, truest representation. Philadelphia Police Department (PPD) ranking officer Michael Cram has argued his officers today bear more responsibilities than before. He likened his police district’s work to political organizing. Cram made these comments at a meeting of the Police Advisory Commission in July of 2016, shortly after a march against police brutality in North Philadelphia. The police captain claimed the action “disrupted the neighborhood and didn’t have any support.” But this author’s photo, printed here, shows youth from the neighborhood spontaneously joining — and even leading — the march. Philadelphia allotted the PPD $643 million in 2016. The City’s Department of Human Services ran on only $103 million that year. Our Public Health Department ran on $130 million. The PPD gets more than twice the funding of these two non-violence-oriented city services combined. It’s not surprising that police find themselves trying to do the jobs of departments that don’t get enough funds. Per-year spending by Philly government on policing, judicial functions and imprisonment has doubled since 1972. Philly in 2016 allotted $1.95 billion for those purposes. This is a lot of spending — and a large labor force to justify. And yet, despite a net population loss in the city since the 1970s  and a sustained drop in violent crime since the mid 1980s , policymakers predict the force will continue to expand. PPD employed about 3,400 officers in 1988, according to data the police union that year gave The Inquirer . PPD in 2017 employed more than 6,300 officers. Philly’s 2016 Five-Year Plan predicts the PPD will hire even more. Though the PPD’s language and posture have become increasingly muted, budget and labor power available to them have grown larger. Is the force trying to appear harmless so the city will keep coughing up money? In the ’60s, cops didn’t try to seem less threatening. Soon after Rizzo became police commissioner in 1967, two busloads of police violently broke up a 3,500-student call for an independently run Black school board and a Black history course. PPD injured 22 people and arrested 57. Most of those injured and arrested were high school students. Rizzo described the arrests and injuries as “a beautiful thing” in a personal interview with a local church group. “If they get tough, we’re tougher,” he told NBC News in a segment on the policing of political organizers and gangs that aired after the school board demonstration. PPD kept Rizzo’s promise by killing 29 residents in 1974, according to use-of-force researcher James Fyfe. The department’s public tone has cooled from however you’d describe Rizzo’s shtick to the modern wet sandwich routine. City finances, however, show the opposite trend. Law enforcement draws more funding away from vital city services almost every year. Anonymous. “Official Protests for Suffragettes.” The Washington Post. 16 Jan 1910. Accessed via Proquest Historical Newspapers. Wilson, Jerry et al. The Police and the Media. Educational Associates. Boston. 1975. Beasley, Norman et al. “Justice Department’s Civil Disorder Initiative Addresses Police Training Gap.” The Police Chief. Oct 2000. Federal Bureau of Investigation. “Responding to Your Concerns: FBI Interviews at Special Events.” 18 Aug 2004. Wood, Lesley. Crisis and Control: The Militarization of Protest Policing. University of Chicago Press. Chicago. 2014. Philadelphia City Planning Commission. “City Stats.” Apr 2000. Pennsylvania State Police Reporting System., Palmer, Chris. “Police: Philly crime at lowest level in decade.” Philadelphia Inquirer. 12 Jan 2017. Ditzen, Stuart L. “On the Beat, Officers Stretched Ever Thinner.” The Philadelphia Inquirer. 2 Apr 1989. Accessed via ProQuest Historical Newspapers. City of Philadelphia. “City of Philadelphia Five Year Financial and Strategic Plan for Fiscal Years 2016-2020.” 2015. Kerner Commission. “Demonstrations in Philadelphia, November 1967-January 1968.” Civil Rights during the Johnson Administration, 1963-1969, Part V: Records of the National Advisory Commission on Civil Disorders. Folder: 001346-009-0580. Lyndon Baines Johnson Presidential Library. Austin, Texas. Accessed via ProQuest History Vault. Huntley, Chet. “Untitled.” NBC News. 19 Sep 1968. Accessed via Vanderbuilt Television News Archive. Fyfe, James. “Police Use of Deadly Force: Research and Reform.” Justice Quarterly. 16 Aug 2006.